If the conditions are cold for you then they are cold for your dog. If they are truly bitterly cold then outside exercise is not the best option. Even for the nip outside tips 5 onwards still apply. While you should always dress warm with layers, the RSPCA advises that coats are only really needed for old and ill dogs. You should never try to put a coat on a dog who is refusing. But then the choice of coats and/or booties is yours. Remember to wear gloves so that you can keep your lead hand warm. This avoids the accidental loss of the lead. Always walk in the daylight. Not only is the temperature usually slightly warmer, but more importantly you can often see dangers such as metal items and icy puddles that need to be avoided. Also keep the walk shorter than usual. Don’t let your dog eat the snow. The occasional snowflake may be ok, but lying snow often contains bacteria. Similarly snowdrifts can be dangerous as the depth and type of snow is unknown so best avoided. Having been for a walk, always ensure that there is somewhere warm to come back to. With sub-zero conditions, we all know that some rooms in the house are colder than others. So share the warmth as body temperatures return to normal. On return, once inside, check all paws for snowballs or iceballs between the toes and remove. 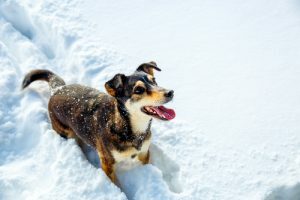 Dogs can get frostbite between the toes if exposed to snow too long. Where possible wash your dog after the walk and/or rub down with a micro-fibre towel. If you’ve been walking alongside roads then your dog’s coat will have picked up grit and salt. Either of these could be poisonous or an irritant to the skin. In cold weather we and our pets burn extra energy just keeping warm. It’s worthwhile providing some extra feed and don’t forget water. Dogs dehydrate quicker than us under their coat and through panting. Finally ensure that they have warm dry bedding to curl up into so they’re comfortable through their sleep. While metrologically we are now in spring, at Henry Wag we’re not ruling out more fun with snow this year.